Because HP recognizes that your monitor is the center of your computing world, HP offers a variety of products designed to complement the monitors and enhance the overall computing experience.The HP LCD Speaker Bar lets you add stereo audio output to your HP flat panel monitor without taking up any additional desk space. 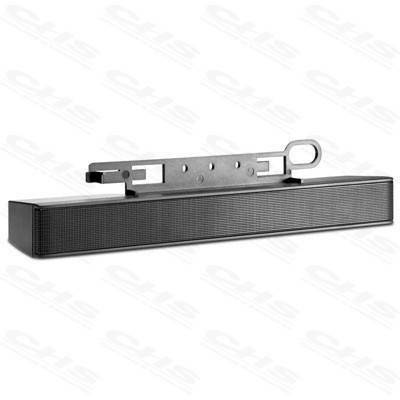 The HP LCD Speaker Bar is an excellent choice for improving the quality of multimedia presentations, streaming online video or web-based seminars. 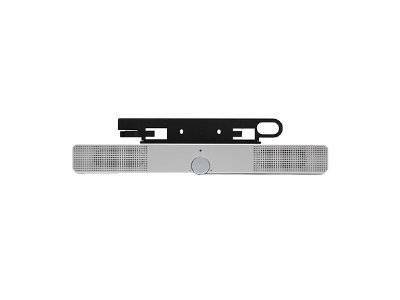 It attaches easily to the bottom of the monitor to bring audio support features such as high-quality speakers and an external headphone jack right to the desktop.The Speaker Bar is conveniently powered through a USB port located either on the PC or monitor (if the monitor has an integrated USB hub), so there are no power cords or AC adapters to be concerned about. Improving the quality of presentations, online video streaming and web based seminars. Taking up no additional desk space and featuring USB plug and play convenience.